Phil Joanou's career began with a phone call from no-one other than Steven Spielberg, and his over thirty years in the business have included such triumphs as working with Spielberg on 3 O'CLOCK HIGH (1987) and his Amazing Stories TV series, the U2 concert movie/ documentary RATTLE AND HUM (1988), the New York gangster drama STATE OF GRACE (1990), which featured electric performances from Sean Penn, Gary Oldman, Robin Wright and Ed Harris, and his wonderful, underseen autobiographical drama ENTROPY (1999). 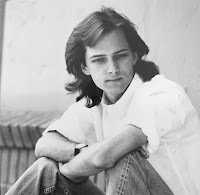 He has worked on a variety of different projects over the years: the films FINAL ANALYSIS (1992), HEAVEN'S PRISONERS (1996), GRIDIRON GANG (2006), and his current release, the horror film THE VEIL (2016); promo videos with U2, Tom Waits, Bon Jovi and Mariah Carey; Chris Tucker's live TV special (2015); the PUNISHER short DIRTY LAUNDRY (2012), and TV episodes of Fallen Angels, Wild Palms and the documentary series Up. In the first of a four-part interview, I spoke with Phil about his early years up to working with Spielberg. What films were the most formative for you growing up? I grew up being the most influenced by the work of Steven Spielberg. JAWS (1975) was the first film that really woke me up to the power of the director. Before then I had just watched movies and taken them as these magical stories that had somehow just appeared out of thin air... and loved them for that, but when I saw JAWS (at age 12) and I was literally jumping out of my chair with everybody else, it dawned on me that someone was behind the camera actually building that kind of tension. I mean, for 90% of the film we never see the shark and yet it's as if the monster is right there... we constantly feel it. I went to see the movie five more times. I was the yearbook photographer and I had a lot of 35mm black and white film from that job so I took my still camera in the theater and photographed every shot in the movie (I had to sit through it twice). I printed up the photographs and put them all on this huge bulletin board in my bedroom. I also recorded the movie's soundtrack on a cassette recorder in the theater so I could listen to the film and watch each shot go by. Remember, this was before VHS and DVD so it was the only way I could think of "owning" the movie and this really was the first movie where I thought, ''The craft behind this film is such a mystery to me that I've just got to figure it out.'' And the more I looked at it the more I realized - I want to do that job. 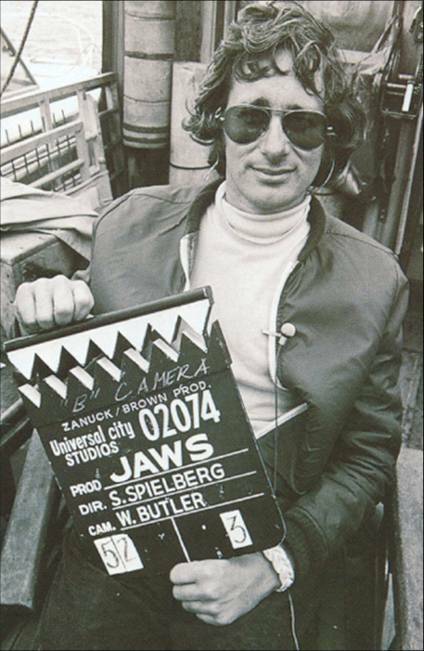 Apart from Spielberg, were there any other filmmakers or films that particularly affected you? Coppola's THE GODFATHER (1972), THE CONVERSATION (1974), and then APOCALYPSE NOW (1979) really inspired me (and remains my favorite film to this day). I was also hugely influenced by Scorsese's TAXI DRIVER (1976), MEAN STREETS (1973), and RAGING BULL (1980). Then there was Kubrick -- from DR. STRANGELOVE (1964) to THE SHINING (1980) and Friedkin with THE EXORCIST (1973) and THE FRENCH CONNECTION (1971). AMERICAN GRAFFITI (1973) also really influenced my student film LAST CHANCE DANCE (1984), which was the project that broke me into the film business. There was a book called The Movie Brats that focused on all those directors from the 70's and those really were my guys. I wanted to emulate them all in so many ways. And of course tha led to me being a Hollywood filmmaker with no specific "brand" or "style" because I wanted to try everything! So I end up making a comedy (3 O'CLOCK HIGH) and a concert film (U2 RATTLE AND HUM) and a gangster drama (STATE OF GRACE) and then a psycho-sexual thriller (FINAL ANALYSIS) right out of the gate. I didn't do what Hollywood really wants directors to do - stick with one genre and hammer away at it your entire career. I wanted to do all kinds of films - I relate to all kinds of films. But it is better if studios and producers see you as an "action" guy or a "comedy" guy or a "dramatic" guy. It's easier for them to categorize you and think of you in those terms. It makes sense, but for whatever reasons, that's not what I did. How did you go about making your first short films? A few years after seeing JAWS my dad got a Super 8 camera, with no sound of course, and I would borrow it to make little short films with my friends. I really studied my favourite movies, and I got some books on moviemaking and would spend hours in the library immersing myself in anything and everything movie related. I didn't have any editing equipment or anything like that so I would literally edit in camera. I would do a wide shot and then go in close and do a cut. Then I would go for coverage and do a cut, then I would go back to the wide shot and all of it was cut within the camera roll. It became more and more of an obsession and I started making longer and longer films, and I finally got a teeny little Super 8 editing machine. Now I could shoot out of order so the stories got bigger. Then toward the end of high school I got a Super 8 sound camera and projector with money that I had saved up from doing a paper route, which I will admit, was very Spielbergian! By the time I was done with high school, I think my longest movie was actually about 55 minutes long. Can you talk about that movie? 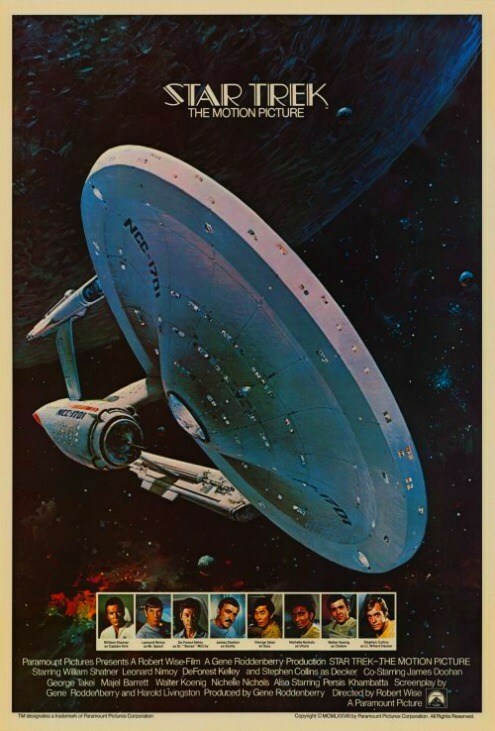 STAR TREK: THE MOTION PICTURE (1979) was about to come out, so we made STAR TREK: THE MUSICAL PICTURE (1979). We built the bridge of the Enterprise out of cardboard from my garage, and my friends and I dressed up as the crew of the Enterprise. I was Bones McCoy. We used miniatures hanging from wires and poked holes in black cardboard to create a star-field... crazy stuff like that. And believe it or not, our STAR TREK was actually a...musical. The crew of the Enterprise would break out into song and dance from stuff that was popular at the time (for instance, Spock sang Supertramp's "The Logical Song.") STAR TREK: THE MUSICAL PICTURE was my crowning achievement before going to film school. I think about six people saw it. I would do these films and then show it to my family and that was it! How did you come to work on the special effects for STAR TREK: THE MOTION PICTURE? My girlfriend's dad was one of the bankers who had helped finance John Dykstra's effects company, Apogee Inc, which Dykstra started down here in the Valley after he broke away from ILM. I got a job as a PA. My job was to spray paint everthing black all day long. The effects guys were working around the clock to stay on schedule, and I got to know all the guys, fetching them coffee and burritos or whatever they needed. I would stay at night and ask the night crew to teach me how all the motion control rigs worked, and eventually they got so shortstaffed and they realized that I could actually operate the equipment so they asked me to shoot on these proprietory motion control rigs that they had built for two scenes on the film. They put me in a room with film from the movie and I shot all the effects for two scenes. I ended up getting a Special Visual Consultant credit, which was crazy. In the meantime I thought that this was going to be my big break into Hollywood, so that's the reason I made my own Super-8 STAR TREK film. On my last day on the movie, before I went back to college, I showed everyone the film in the Apogee screening room and they got a big kick out of it. Can you talk about some of the other short films you made? I made a horror film called ALBINO HILL, and we did comedies, spy movies and other silly things. I think I did close to twenty full-blown narrative short films on Super-8 before I went to USC's Film School which is where I made LAST CHANCE DANCE -- kind of a romantic comedy set in high school. Like I said, it's very AMERICAN GRAFFITI in tone. It's about this kid who has pined away for this girl his entire life and dreams of taking her to the final big high school dance of his senior year. He gets his shot to take her, and of course the whole thing unravels, and his buddy, the girl next door, ends up saving him. The film was my final senior project. What they did was that 250 students handed in scripts and they approved 6 of them to be directed. I didn't make the cut the first time I applied, so I stayed in school an extra year to get the chance to do the film. Finally, I made it through the gauntlet the second time and got to make LAST CHANCE DANCE. Without that movie, I don't know if I'd have ever gotten a job as a director. It really was make-or-break for me. How did you get to the attention of Steven Spielberg? To this day, I don't really know! The film had had a big screening at the end of the year and a lot of agents and producers had turned up. It was tradition for everyone to put their phone number in the program. College was over, so I was home, and the phone rang. My mom picked up and a woman said ''I have Steven Spielberg on the line, calling for Phil Joanou.'' My mom turned to me and said ''It's for you. It's Steven Spielberg.'' I was like, ''Yeah, sure.'' I took the phone thinking it was one of my friends screwing around with me and a voice comes on saying ''Phillip, it's Steven Spielberg.'' Of course I recognised his voice right away and I was just dumbstruck. He asked me if I was available to come meet him the next day at Amblin. In that meeting he told me that he had been on a private plane with Kathleen Kennedy, Frank Marshall and Bob Zemeckis, flying back from New York to LA, and they had had a VHS copy of LAST CHANCE DANCE. I do not know how they got it. They all watched it on the plane and I guess they enjoyed it. How did that lead to working on two episodes of his TV series Amazing Stories? At that first meeting he gave me a script called SANTA '85, which was for the series, that he was producing that year. That project was my first professional directing job. I was 23 years old and I was scared out of my mind! 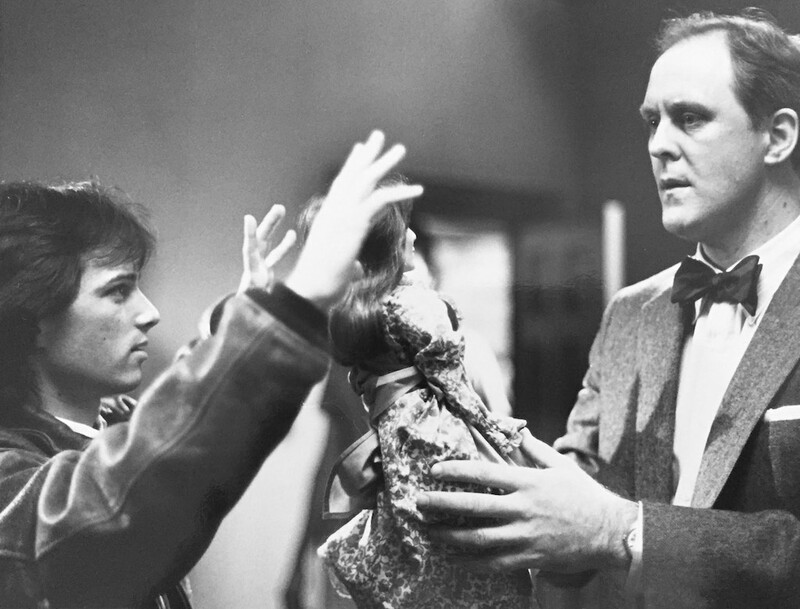 But it all went well and then Steven offered me THE DOLL, which was an interesting one because it was originally written by Richard Matheson as a Twilight Zone episode, but the series got cancelled before they were able to make it, so it was a real thrill to direct that one. John Lithgow got an Emmy for Best Actor for that episode. 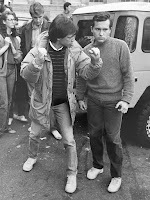 Following then following that, Steven asked me if I wanted to direct 3 O'CLOCK HIGH. With all these great things happening so quickly. how were you affected by it all? I was very naive. No-one in my family was in the film business. 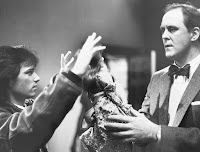 The first film set I ever visited was watching Steven direct his episode of Amazing Stories. The second one I was on was watching him direct THE COLOR PURPLE (1985). Those were my reference points. It was beyond a dream come true. When I look back at it all, I remember feeling like it wasn't real, and that at any given moment, someone was going to tap me on the shoulder and say ''You, kid, get out of here.'' I was scared to death. Even on 3 O'CLOCK HIGH I assumed I'd be fired after two or three days. I was going to work each day thinking ''Well, if I make it through two or three days it's better to have had a chance than to not have had one at all.'' Inside I was pretty freaked, but I was also thrilled that I was getting the opportunity. It was a very strange mix of emotions. It really took many years after I got through that phase of my life to see how truly special and unique this all was. I mean, I had an office at Amblin' for five years. I got to watch Steven develop JURASSIC PARK (1993), make EMPIRE OF THE SUN (1987) and ALWAYS (1989), then work on SCHINDLER'S LIST (1993). It truly was amazing. Did you have a good relationship with Steven? We used to enjoy hanging out talking about movies and the film business. He'd always be telling me stories about the making of his movies -- the ups and downs. It was incredible. And later, when I got away from it and I was on my own I really saw how unique the whole thing was in terms of how the business worked. The kind of freedom that I had with Steven is completely one-of-a-kind. When you had his support, you basically could do what you thought was best without interference. And of course the business was very different back then. You had someone like Sid Sheinberg running Universal and making all the final decisions so all I had to deal with were Steven and Sid. Later on I saw that it was VERY different without those guys backing me up! I really regret that I didn't take better advantage of my time with Steven. I wish I had made an Amblin' movie with him. It would have been great if I'd been able to find a place at Amblin' like Bob Zemeckis had done, but it just didn't work out that way. 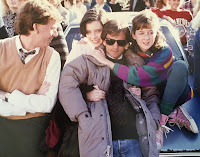 I did get to do 3 O'CLOCK HIGH with Steven, but it wasn't an "official" Amblin' movie. The project was owned by Aaron Spelling and Steven was respectful of that so he ended up being the silent producer on the film. When you took on 3 O'CLOCK HIGH, were you keen to avoid some of the cliches of the high school film genre? 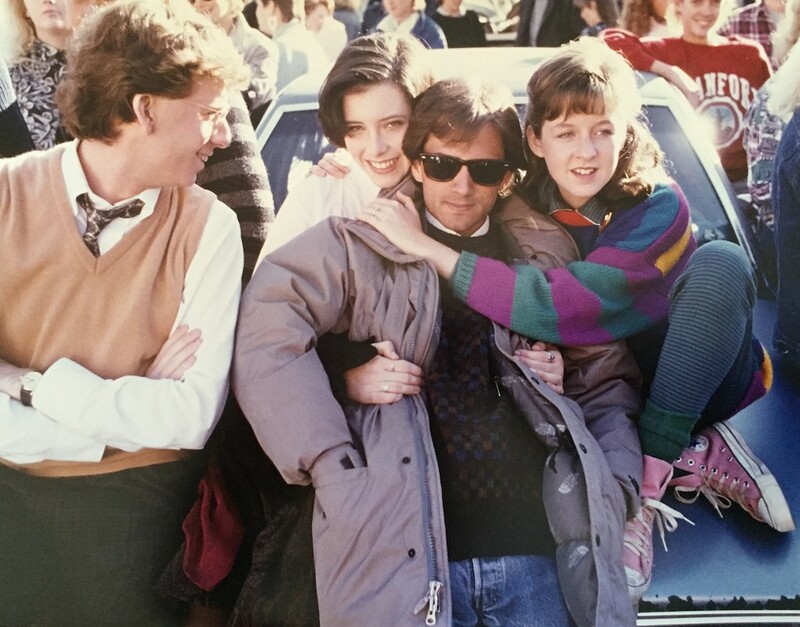 The original script was called After School and was very much a John Hughes style comedy, very broad with lots of slapstick. When I came on I had really loved Martin Scorsese's movie AFTER HOURS (1985). If you compare Scorsese's film with my film, you will see that I was heavily influenced by AFTER HOURS, as in I stole a ton of stuff from it! In the film, Griffin Dunne is trapped down in SoHo and no matter what he does, he can't escape his fate. It's very similar to 3 O'CLOCK HIGH in that this kid is trapped in high school and no matter what he does, he can't escape. 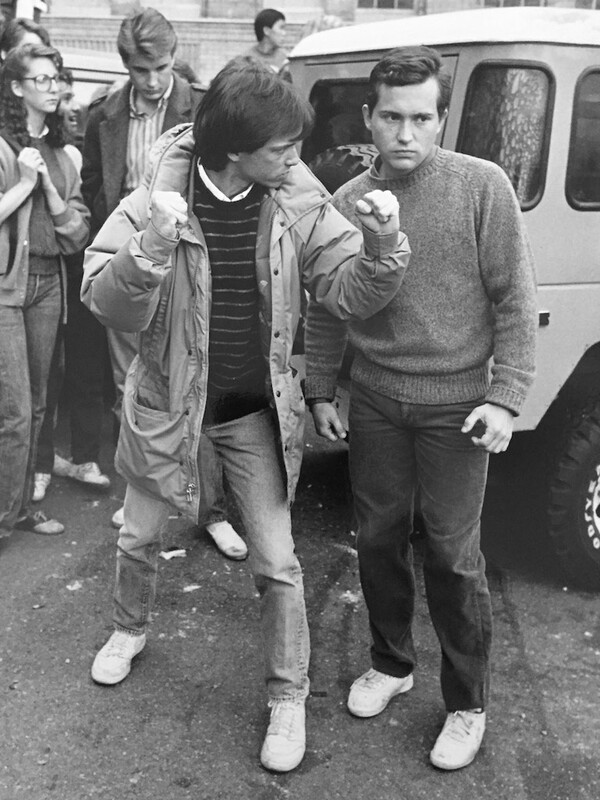 The original script was much more about him having to confront the bully, and I added ''Well, what if he tried everything he could think of to get kicked out.'' The ticking clock and the trapped hero were what I brought to 3 O'CLOCK HIGH. I also tried to make it much more of a black comedy as opposed to a straight-ahead teen comedy.